This is the time of year where we need to take time to reflect and remember those who we have lost this past season. At this time we know that they are all in God’s care and we need to remember that. I wish to say from all of the Officers and Board of Directors of MARFC Happy Holiday’s to all of you and may you have a Joyous and safe New Year. On a Sad Note! We send our deepest sympathies to the family of long time member Lee Poczik who passed away last month. Our thoughts and prayers are with his family at this time. First up was Bill Janitz PR Director from the Michigan International Speedway. Bill gave a great presentation of what the fans can expect for the 2003 season. The IRL combo weekend will be a fantastic deal for only $ 50.00 the whole weekend. MIS has already locked down our fan club day for 2003 on August 15th. Up next we had Bob Capps subbing for Tony Eckrich who hand to be at another venue and he explained about the new racing course at KART2KART and informed us about the Racing for Kids fundraiser on tap for later in November. Ron Watson from the Motorsports Hall of Fame in Novi was on hand and talked about their annual inductee’s banquet and the hall of fame itself. He also mentioned that all employees that work at the museum are all volunteers and they all attended the banquet for their time they have donated. He also talked about the museum moving in the coming year when they find a location they can use. Eric Lee was our next guest and he told us of how he got started racing first in go-karts and then enduro cars. Then he moved up to limited late models at Owosso Speedway and now he is running late models at the Flat Rock Speedway and this year he won Rookie of the Year and finished 3rd in the points. Eric along with crew chief/car owner his father Steve Lee will be back in late models at both Flat Rock & Toledo in 2003. Eric mentioned that he was a 3rd generation driver from the Lee’s as Steve’s Dad was also a driver. Last but not least, we had the Cronenwett family with us. First the father’s both Steve & Randy told us about their past season. Steve said he’d like to forget most of this season due to some bad crashes, but hopes to do better in 2003. 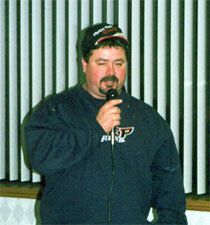 Then Randy informed us that he is retiring for the Figure”8″ division and will give a late model a try part time in 2003. Steve also told us that the Cronenwett family is also a 3rd generation of racers. Then came the kids, first was Tayla Cronenwett-Knight who just got back form her honeymoon. She married street stock champion Ken Knight. As you might recall, Ken asked Tayla to marry her at our banquet back in January. Tayla drove in the factory stock division at Toledo and ran some enduros at Flat Rock. Randy Jr. also raced both at Toledo and Flat Rock and won a few races this past season and hopes to be able to move up to the street stocks next year. 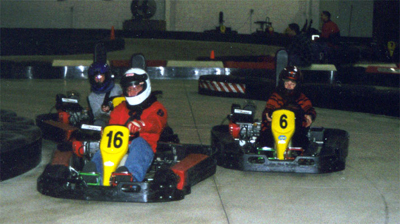 Steve Jr. raced in the same divisions as his sister and cousin. He too won a few races and hopes to move up soon. Greg was last and the youngest and he just this year was able to get into the pit area to help his dad work on the racecar. He also raced go-karts and won many times this season and if he keeps up his grades and saves some money will also join the others. The kid’ s all said that they were thankful to their parents and families to give them a place to grow up and a goal to keep them off the streets and away form drugs and alcohol. I thought that was pretty special in my book. 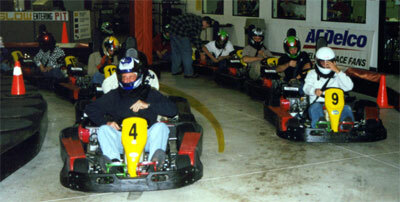 And Finally, we topped the meeting off with some pretty serious Go-Kart racing. Unfortunately, Kart-2-Kart officials thought we were having too much fun and black flagged a few of our more “aggressive” drivers. I am proud to announce that the Michigan Automobile Racing Fan Club is now once again part of the MSPA. (Michigan Speedway Promoters Association) We are glad that we will be able to be included in helping our fans and the promoters to better the sport of auto racing across the state. 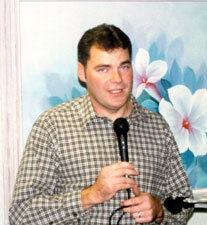 Just a reminder that it is membership renewal time so get your renewal in and be ready form the 2003 season.Our 37th Annual Awards & Dinner Dance will be held on January 18, 2003 at the Imperial House Banquet Hall located on Groesbeck in Clinton Twp., Michigan. For more information or to purchase a ticket please contact me at president@marfc.org. 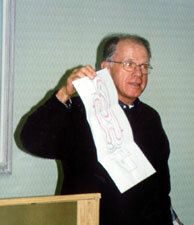 Our first meeting of the year was held on October 19, 2002. 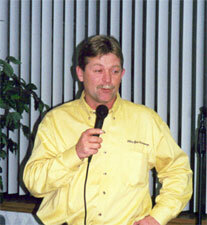 Our guest speaker for the night was Kevin Feeney, AVSS & USAC Sprint car driver. 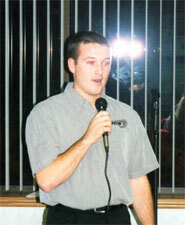 Kevin talked about how he got started in racing first in quarter midgets and then in sprint cars. His Mom & Dad were the biggest supporters he had in the early years. Now he drives for Jim & Nancy Hanks and they have run some USAC races, won a few features in AVSS and have set a new track record for Salem Speedway at 14.499. Now that fast! 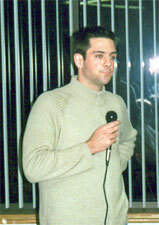 In 2003 Kevin hopes to continue to run well in both AVSS and USAC. Kevin in his spare time also does many charity fundraisers for kids. He thanked his wife and family for all of their support through out his career. Bob Capps of Kart 2 Kart also showed us the new track configuration, giving us the heads up before our November meeting that it was faster and more challenging. 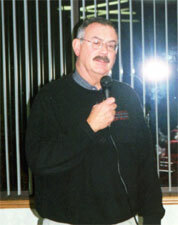 A very special thank you to Ron Drager & Roy Mott and the Toledo Speedway for adding an extra fan club day last month. Many fans were on hand and had a great time watching the Sportsman cars run and well as the conci races for the Glass City 200 Late Model show.Thanks again to all the staff at Toledo Speedway for a great night. All of us here at MARFC would like to send our deepest sympathies to the family of Dion Kevin Parish a Kalamazoo resident and modified driver that was killed during a practice run at the Kalamazoo Speedway last month. Our thoughts and prayers are with his wife and children at this time. Get well wishes to Modified driver Tim Avery who had a very bad crash at Mid-Michigan Raceway Park. Tim will be out of action for up to nine months with a broken back and we hope and pray that he will be able to return to racing again sometime next season. Good Luck Tim and a very speedy recovery. Don’t forget our monthly meetings start this month and our guest speakers will be Kevin Feeney AVSS Sprint car driver and Mike Brudell writer for the Detroit Free Press. So come on out and have a good time. 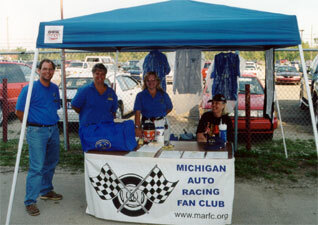 As the 2002 season finally wound down, Toledo Speedway added a special surprise Fan Club Day to the schedule. MARFC Members were admitted free to the Saturday preliminary events for the Glass City 200. A Special Thanks to Ron Drager and Roy Mott for this last opportunity to see some fabulous racing this season. Well it is close to the end of another racing season and many new champions have been crowned along with some repeat winners also with some still to be challenged. We here at MARFC Congratulate all the winners through out the state and hope that all had a fantastic season. With the end of racing season comes the time to think about membership renewals so, get a jump start on the 2003 season and renew your membership today or if you would like to join the best racing fan club around just click on the membership link and sign up today. The Michigan Auto Racing Fan Club would like to send it sincere and deepest sympathy to Karl and Mary Kay Kiefer owner and promoter of the Owosso Speedway for their loss of their two year old son this past month. Our thoughts and prayers are with the entire Kiefer family at this time. Another great trek up into the UP to the Kinross Speedway. Members on hand saw some great racing with at special 50 lap Modified UP Shootout show to boot. 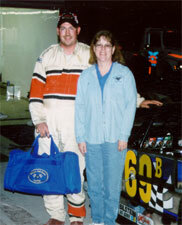 Modified # 69b driver Tommy Beezley from Columbus City, Indiana was given the MARFC/Uniform Helmet Bag for the longest haul. Tommy eventually finished 2nd in the feature. Thanks to Gerry Liscumb, Dan Remillard, and Walter Verdecchia for asking us up again this year. Special thanks to Board members on hand Sue Ginter, Laura Tucker and Jimmy Tucker for their helping hand. Mother Nature tried to put a damper on our day at M.I.S. but we made it through anyway. Seen a few members around the track and we all had a good time even with the rain delay. We would like to Thank Brett Sheldon President of the Speedway and Bill Janitz for their support of our venue at the best Super Speedway around. We wish to thank Tommy Cameron for his years of support to our club and wish him well in his new endeavors now that he has moved on from the Speedway. We hope that the new PR person that replaces Tommy will support our club like he did through out the years. Great weather once again even if rain tried to slow down the event at Merritt. A spectacular night of racing with SOD Sprints on hand as well as the MMA Modifieds and Street Stocks. Board member Bill Walters presented the MARFC/Uniform Helmet Bag to Michigan Modified driver # 90v Bob Hutson. Bob had major heart surgery awhile back and is already back racing and winning. Great going Bob. Helpers on hand were Bill Walter, Jim & Barbara Buckley, and Pat Wolfe. We even seen Larry & Kenny Letts stop by to say Hi. Very Special thanks to “Chief again for a great PR job and thanks to Ed & Carmen for their continued support and willingness to invite us back year after year. Thanks again Ed & Carmen. Fantastic night for racing once again. The members were treated to a surprise visit by the Zooperstars and they entertained the fans to the max. Over a 100 cars in the pit area made for some great racing. MARFC VP Rob Michon & Member Steve Russell gave our MARFC/Uniform Helmet Bag to Street Stock # 49 Rick Grzych for being the 4th fastest qualifier for the B-Main cars. Very Special thanks to Scott Schultz, ARCA, Ron Drager and all the staff at the Flat Rock Speedway for a great time and all their continued support through out the year. Helpers on hand for the night were, Steve & Cory Russell, Rita Schroeder, Cathie Rohloff, and Dave DeHem.